Down in the sewer lair, Mikey is showing off some moves to his unimpressed brothers, who are all pretty smug about their ninja abilities. Seeing this, Splinter forces his sons to trade their weapons to remind them what being an amateur feels like. He tells them that they can either go out on patrol with weapons they don’t know how to use, or they can stay in and clean the lair. Out on patrol, they spot a bunch of Purple Dragons robbing a music store. They take the Dragons down, but not exactly by learning to master their new weapons (mostly, they just kick and club them). Suddenly, Don finds something on a ground. It’s a sophisticated burglar alarm-neutralizing device, far too hi-tech for the Purple Dragons to have designed. The owner of that device immediately shows up to reclaim it: Baxter Stockman! Or rather, four large robots with TV screens on their torsos bearing Stockman’s image. 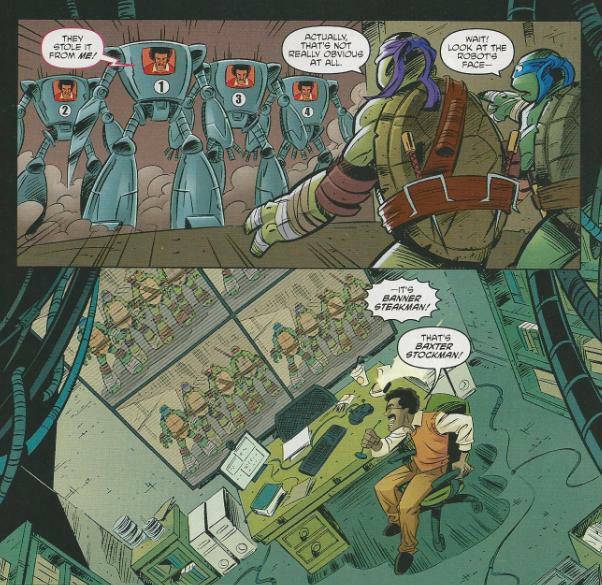 Stockman tells the Turtles that he’s programmed all four robots (which Mikey dubs the Revenge Action Androids, or RADs) with their martial arts skills and that they’re unbeatable. Knowing this is a serious battle, the Turtles trade their weapons back and engage the RADs. Having been programmed with all their battle data, the RADs effortlessly counter each Turtle’s attack and the TMNT find themselves fought to a standstill. Leo realizes that in order to beat the robots, they’ll have to do something unexpected; something they’ve never done before. So they swap weapons again and attack. Donatello calculates some trajectories and throws his sai, which ricochets off various surfaces and hits RAD #2 in the back, deactivating it. Raph breaks his bo staff in two, turning it into a pair of escrima. RAD #4 can’t block the move and Raph stabs it through the chest, deactivating it. Being chased by RAD #1, Mikey begins spinning his katana, turning them into buzzsaws. RAD #1 overcompensates trying to parry, allowing Mikey to move it into position where it accidentally slices RAD #3 in half. Stockman realizes he’s lost this one and orders RAD #1 to escape (with all the new data it has collected on the Turtles and their fighting styles). Leo isn’t about to let that happen and hurls his nunchaku at the RAD’s legs, tripping it and causing it to fall and impale itself on a fire hydrant. Back in the sewer lair, the Turtles tell Splinter all about their encounter. Splinter is pleased and offers them a more challenging assignment. Leo says they’re ready for anything. Of course, that assignment turns out to be cleaning the lair. 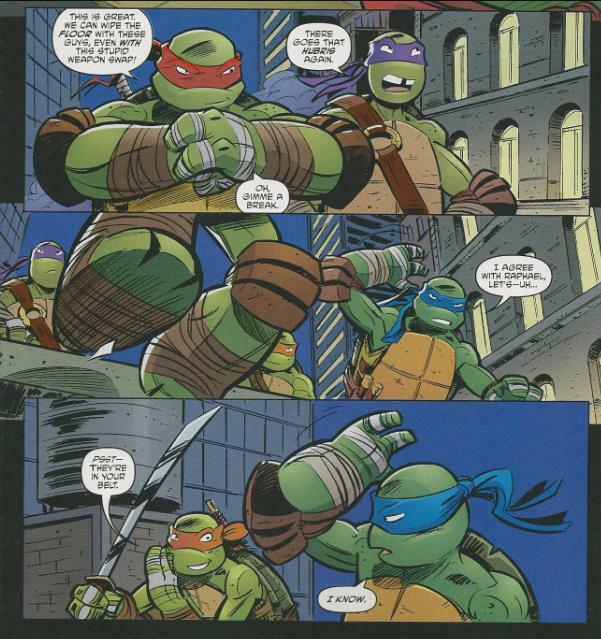 *The story continues in TMNT New Animated Adventures #1. 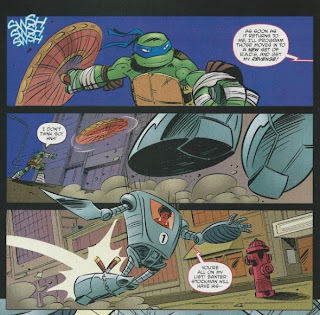 *In regards to the Nickelodeon TMNT animated series this comic is intended to be a supplement to, chronologically, this issue would have to come between the season 1 episodes, "I Think His Name is Baxter Stockman" and "Mousers Attack!" I suggest this, as Stockman is not shown to be a slave/employee of the Shredder in this issue. *Coincidentally, just one week after this issue was released (May 11), the episode "Pulverizer Returns!" utilized the exact same concept of the Turtles switching weapons under Splinter's orders. The switch was treated by the episode as the first time they'd ever done such a thing, creating a bit of discontinuity between this comic and the cartoon it supplements. *This special issue was only made available as a promotion for Free Comic Book Day, 2013. *Almost a year before this issue was released, IDW published TMNT: Special Edition #1 as a San Diego Comic Con exclusive, featuring the Nickelodeon TMNT characters. Man, I am late to the party on Nickelodeon’s new TMNT cartoon. It was just bad timing, really. I moved across country a few months before the show started and I had to give up cable. So I’ve been out of the loop on the show, which I think is up to 21 episodes as of right now. In anticipation of being able to actually understand the upcoming TMNT New Animated Adventures comic book series, I decided to catch up. I’ve only seen through episode 9 so far (that’s “The Gauntlet”), but I’m digging it quite a bit. It’s extremely episodic and toy-centric and is more “mutant of the week” than any TMNT show we’ve ever gotten before, but the writing is really clever, there are several overarching narratives that keep you coming back and man is it good to hear some familiar union voice actors in a TMNT cartoon for a change. But I think I’ll save my first impressions on the Nick TMNT cartoon for another article. 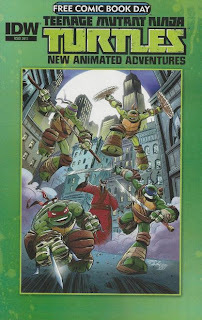 This review is for the Free Comic Book Day special issue of IDW’s TMNT New Animated Adventures comic. Erik Burnham has been doing a lot of great work for IDW. His Ghostbusters book is something everybody should be reading and his contributions to their TMNT mythology have been great, too. He has a talent for capturing the voices of established characters and you can see that skill at work in this issue. Everyone has their little quirks unique to the new TV show on display, such as Mikey’s love of naming their enemies to Splinter’s propensity for shouting commands in Japanese (though “yame” really shouldn’t be parsed as “ya me”). The banter between the TMNT and Baxter was especially strong, deftly channeling Phil Lamar’s performance as the pitiable, downtrodden nerd. Though does Leo call Mikey “little brother” so often and so awkwardly in the new show? I never noticed it, but I’ve only seen the first 9 episodes. It seems a little out of character for what’s got to be the most laidback, fun and entertaining Leonardo we’ve ever gotten. What I think brings this issue down is the fact that, well, we have seen this all before. I don’t know if it’s a coincidence or an intentional homage, but the conflict of this story is identical to the climax of the 4Kids TMNT episode “What a Croc”. In that episode, Baxter Stockman builds a robot called the Turtlebot that’s programmed with all of the TMNT’s battle data and move sets. The Turtles fight it, but it counters all their moves and they can’t touch it. So what do they do? They switch weapons, which confuses the unprepared Turtlebot and they make short work of it. To Burnham’s credit, that plot point was done very quickly in the 4Kids episode, whereas in this issue it is the crux of the whole story. One could say that the 4Kids writers squandered that bit of story potential and Burnham just opted to do it justice for this comic. Regardless, though, it’s all very familiar and you may feel a lingering sensation of déjà vu as you read it. Dario Brizuela was an excellent choice for art duties on this title. He’s had lots of prior experience on the Turtles, having drawn many issues of Tales of the TMNT Vol. 2 for Mirage, and he was one of my favorite recurring talents from that run. He doesn’t seem to have too much trouble adjusting to the character designs of the Nick cartoon, though I think he renders Don’s head a little weird. Admittedly, in the cartoon his head is kind of goofy looking, being all skinny and pill shaped with that doofy gap in his teeth. But hey, you work with what you got. So far as Free Comic Book Day promotions go, this was an excellent free goody. It’s a full issue, not just a 5 page short with a bunch of concept art thrown in the back or a collection of selected reprints. You’re getting a full issue of the new series for free, and that’s a very cool gift from IDW. All in all, this promotional prelude comic has me excited for the new ongoing series. The cartoon’s fun and if you haven’t seen it yet or maybe quit after a couple episodes, I’d recommend giving it a chance. Burnham’s got the characterizations down and Brizuela has been doing TMNT art for so many years he’s got it down to a science. While the story in this issue seems nicked directly from an episode of the 4Kids cartoon, Burnham wrings a lot of extra story potential from it and it’s a lot of All Ages fun. Huh, I had no idea that a similar plot was used in the 4Kids cartoon. I'm actually watching it now since I've never watched the series in its entirety (missed broadcasts and the amount of DVDs rivaling FUNimation's Dragon Ball Z releases put me off), so I'll have to keep an eye out for that. This was a fun issue, and I'm enjoying the Nick cartoon more than I thought I would. It's a little too "Fred Wolfy" at times for me, but the overarching plots and some of the new characterizations really make it a lot of fun to watch. And I really enjoyed Dario Brizuela's artwork as well; I might have to try and hunt down some of the issues he did for "Tales of the TMNT" vol. 2. What's interesting to note is the Turtles personalities and dialogue feels EXACTLY like their cartoon counterparts. 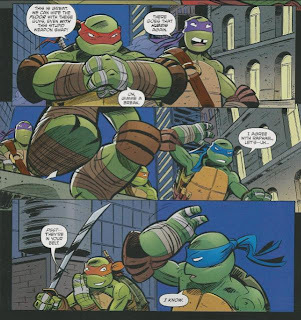 Whereas in Archie TMNT Adventures, the turtles personalities and dialogue was very different from their Fred Wolf persona's. Raphael was much more hot-headed in Archie, and Michaelangelo didn't use his, "Holy Guacemole!" or sufer dude lingo. Looks like the Nick comic is sticking far closer to the cartoon than Archie TMNT Adventures did. @Anonymous: Groups of interest as well as the crative teams behind the Archie comics and the Fred Wolf show were totally different. Apart from the first few issues they went their separate ways with the characters as much as with the story (they kept the belt buckles with the initials though :D). In case of the new IDW comic it is something that expands on the Nick universe which is I guess because the same people are financing them. That someone was me! I post as DrSpengler on the Technodrome Forums and as Spengs85 on the IDW Forums. Erik and them are all pretty good sports when it comes to my reviews, I've found. :D I had a feeling it would be you, being a Ghostbusters fan and all. For the record, the turtles switched weapons in yesterday's nicktoon as part of the latest lesson from Splinter AGAIN! So now Jeremy Shipp has some explaining to do too. :D I thought that at least the writers of the new show and the corresponding comic would communicate. I can photoshop a better one later. And while you're at it why don't you just review the whole dreaded Fleetway TMHT UK original stories series? :D Some people actually like those, I really couldn't stand them. Thanks! I haven't thought about how I'd tackle the UK Fleetway TMHT comics yet. Likewise the Fast Forward comics from a few years back. I'm going to keep on chipping away at Mirage for a while, first, but I appreciate your making the comic available for me! Yes, big thanks for sharing! It's a generous contribution. And sorry for being a sarcastic @ss about it. I'm actually quite open for TMNT "rarities" myself. And I guess many of Mark's readers are. Been trying to scan the most ranom or hard to get stuff to share.